It’s been a while since I’ve posted, mainly due to a two week holiday in France (Brittany), and the heatwave beforehand which meant I was spending the vast majority of my spare time in the garden rather than on the computer! Whilst I’ve been away my father kindly built me a potting shed so I can spend even more time in the garden! This was a “dead space” between the north-end of the garage and the greenhouse which didn’t get any sunlight. It’s protected from the elements with an outside light and power socket with a workbench to do various odd jobs on. Handily placed for the greenhouse and garden I think it’s going to make those winter sowing and potting on jobs so much easier. I was very impressed when I returned from holiday to see the finished result! 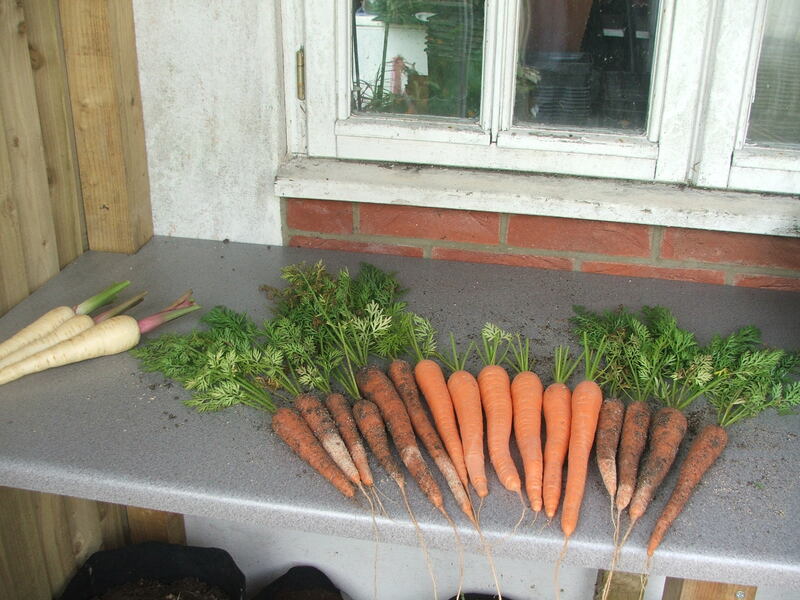 I picked some carrots recently, these were grown in a couple of dustbins and the best three went as part of my Top Tray entry for my local Horticultural Society Summer Show. I wasn’t going to enter having just got back but I managed to stage a few entries in the end. 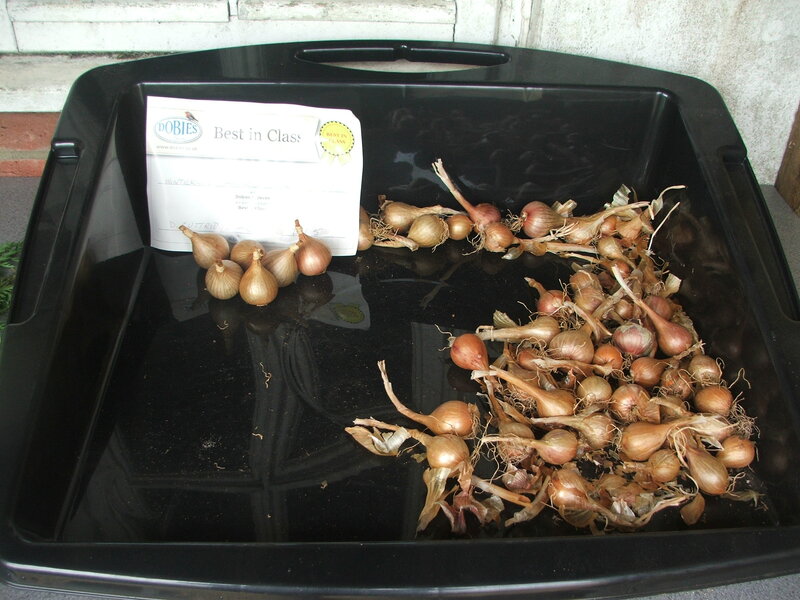 And my shallots won first prize and best exhibit in the veg division as well which I was very pleased with. Would like them a bit bigger but they were a good shape and colour. 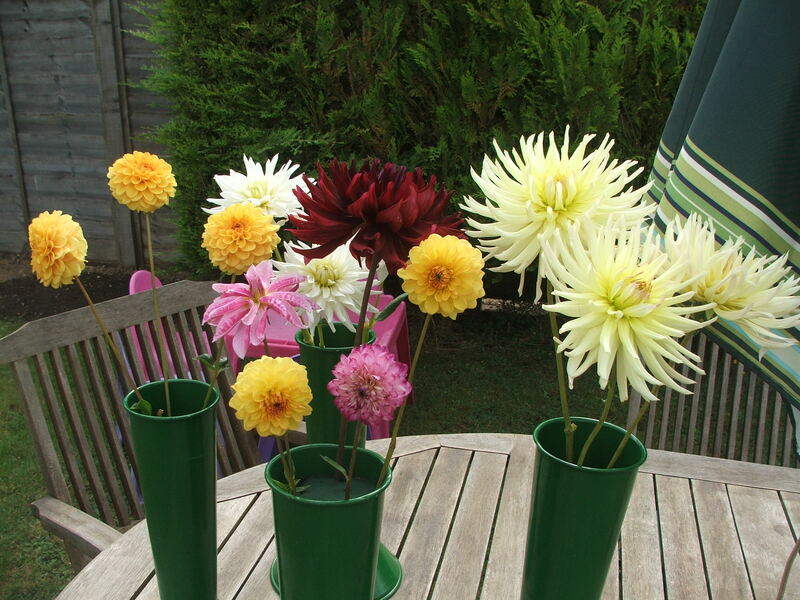 I also won first prizes for 3 of the 4 Dahlia classes I entered – I forgot to take the camera to the Show so these were taken the day after. They include Pink Giraffe which I’ve nurtured from a small tuber kindly sent to me from a fellow veg blogger. The Dahlias fill my main flower bed to the front of the house which is in full bloom at the moment against the deep purple backdrop of the tall, Red Orache running through the centre of the bed. I’m also pleased with my bedding plants this year which I purchased at the NVS Hampshire DA plant sale in May and potted on. 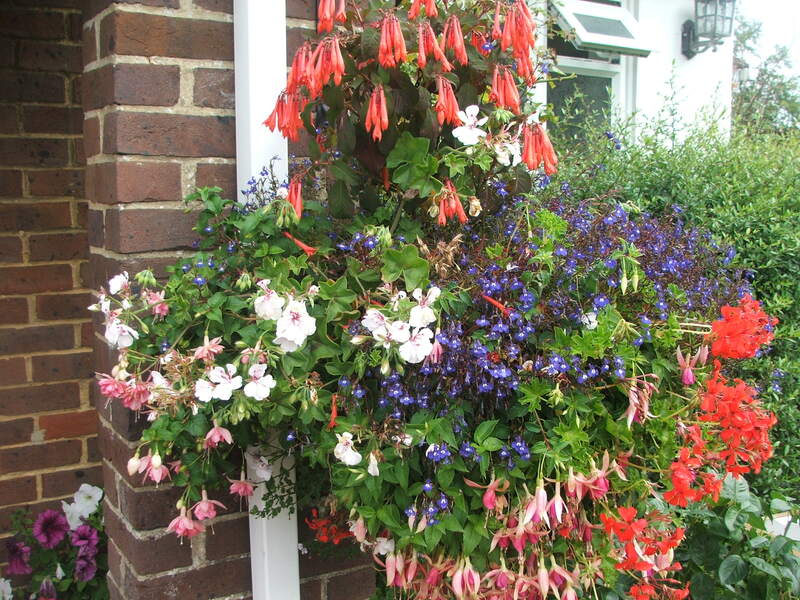 This is one of the hanging baskets full of flowers. Lots of veg coming off the plot at the moment. Our favourite by some distance are the Sungold tomatoes both inside and outside of the greenhouse. Amazing flavour and eaten like sweets straight off the plants! And the courgettes have been fruiting like crazy which we love roasted with onions and peppers. Fingers crossed the veg will keeping on going well into the Autumn. It’s not all been good though, a lot of scab on the potatoes – not sure why – and cucumbers almost died whilst I was away – they had plenty of water but turned yellow although they are starting to come back now. So as always with grow your own a mixed result but the successes far outweigh the failures. The cherry tomatoes we’ve bought in the past from our local supermarket are a million miles from the flavour we have from the homegrown ones – well worth the effort! This entry was posted in Grow Veg and tagged courgettes, Cucumber, Potatoes, potting shed, Tomatoes. Bookmark the permalink. What a beautiful hanging basket. Thanks very much, they survived the holidays thanks to family and our neighbours for watering! Like the potting shed – as you say some you say some you win and some you don’t. Thanks Sue, yes always the way with grow your own. 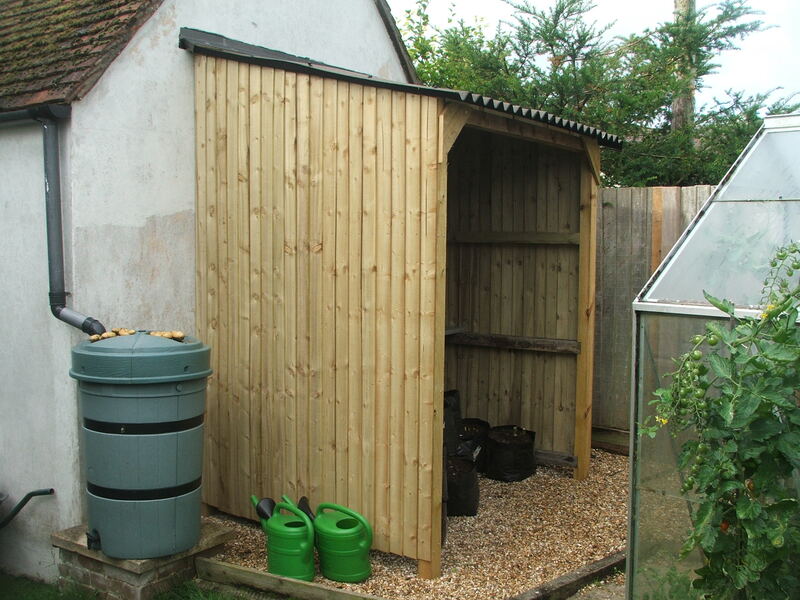 I’m green with envy at your potting shed, it’s a beauty and I’m sure you’ll be able to spend even more time in the garden now you’ve got something to shield you from the elements. My shallots haven’t done so well this year, they’re on the small side too. Thanks Jo I love it and can see it getting a lot of use. The acid test for my shallots will be the National Vegetable Society South West Show on Bank Holiday Monday! Hi Damo – what a grand thing to come home to, I’m envious! Thanks VP I see now…….there’s always one isn’t there! I thought I had to sign up to leave a general comment, as you can see I’m easily confused! !Thanks for sorting it out. Have you considered creating a winter curtain for your potting shed? I saw it is with windows from the house, so with that additional protection, you would be able to over-winter more frost susceptible plants etc. Thanks very much that’s a good idea I may be able to hang some heavy duty clear plastic sheeting over the entrance to make it into a winter store.